These books are a collection of new imaginations and illusions which take the young ones in an altogether a different world. This helps them to create their own world and dream about new creations. Poetry encourage them to play with sounds and meanings of various words in a familiar and fun filled context. 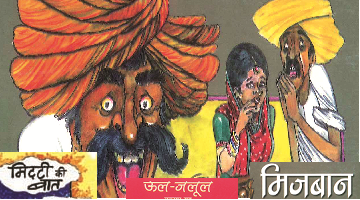 An enchanting story about Chhote Chacha. Unravel his unique personality and read about how Sarita, R..
सबरी, अपनी चित्रों की दुनिया मे रहती है, उससे अन्याय सहन नहीं होता। वह सवाल करती है और उसका दो..
कहानी कहने-सुनने का सिलसिला न जाने कितना पुराना है। कहानिया नदियों की जलधारा की तरह सतत् बहती आ रही ..
आठ कहानियाँ। जो देखती हैं अपने आसपास की दुनिया को। रिश्तों और संवेदनाओं के कुछ उलझे-सुलझे एहसासों को.. Renowned author Sukumar Ray’s hilarious nonsense story starts with a boy waking up and finding that ..